SANTA CRUZ, CA. 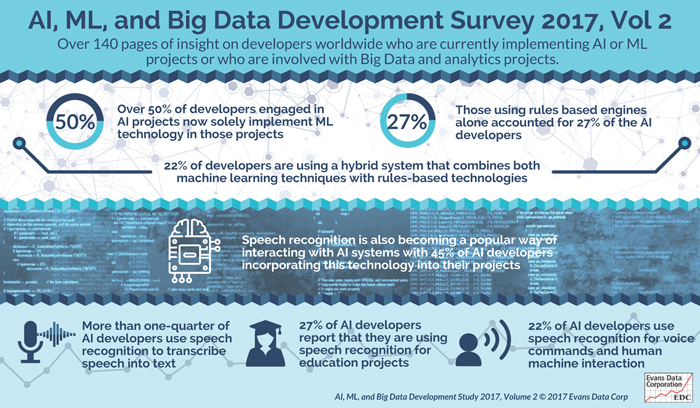 Dec 5, 2017 Just over 50% of developers engaged in artificial intelligence projects now solely implement machine learning technology in those projects, according Evans Data’s recently released Artificial Intelligence, Machine Learning and Big Data Survey. Those using rules based engines alone accounted for 27% of the AI developers while just a little more than 22% are using a hybrid system that combines both machine learning techniques with rules-based technologies.